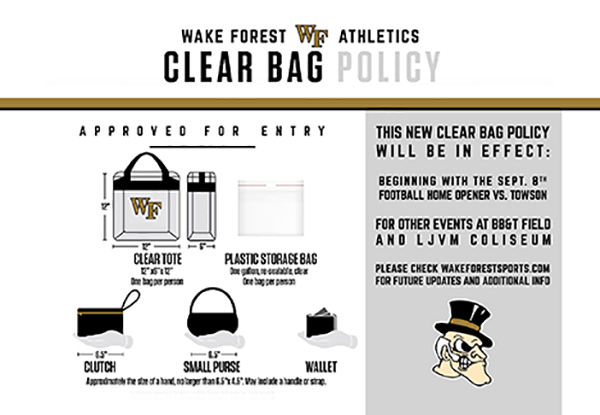 Wake Forest will institute a clear bag policy for all events going forward at BB&T Field and the LJVM Coliseum. The policy will help enhance existing security measures and ensure a safe environment for all guests while making for a quicker entry into the venues. Fans will be permitted to enter with a clear bag that does not exceed 12” in height by 6” in depth by 12” in width. A simple one gallon clear plastic bag, such as a Ziploc bag or similar, is acceptable. Clear bags are also available for purchase at deaconshop.com. Fans will be allowed to carry in a small clutch bag, approximately the size of a hand, not to exceed 4.5” by 6.5”, with or without a handle or strap. Does My Student Need a Ticket? Students are able to swipe into the student section at no charge, but this section isn’t open to families. 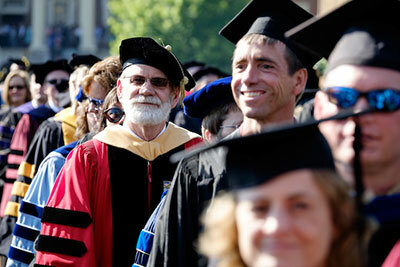 Our recommendation is to buy your student a ticket to guarantee their seat with the family. Bleacher-style, or Standard Seating is located on both sides of the stadium and can be purchased with your Family Weekend registration. Please note the Student Section is located on the East side of the stadium. 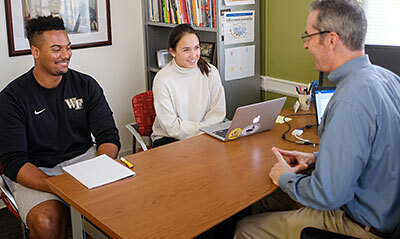 Members of the Deacon Club, the WFU Athletics Booster organization, are able to purchase seating in the Touchdown Club and McCreary Tower areas of the stadium. To learn more, contact the Athletic Ticket Office at 336-758-3322 ext. 1. Need accessible seating? Please contact us and we’ll help you with the arrangements. What if you’re not sure how many tickets you’ll need? Ordering tickets through the Family Weekend website gives you the ability to edit your order until midnight on September 21. Any seats you purchase before that date will be seated together, according to the date of the first purchase. You’ll notice that the start times for game day events are listed as TBD. We generally don’t receive the start time of our home football games until TV schedules have been determined, about ten days prior to the game date. As soon as we know, we’ll post the time on our website, and quickly update the start times for shuttle transportation and the Game Day Cookout, which begins 2 ½ hours prior to kick off time. Parents often ask us what plans they should make for game day, and what we think their student might prefer to do. That’s hard to predict, but we can tell you that the area around BB&T Field will be humming with activity. The student tailgate area is located inside Gate 4 of the stadium and families are welcome, but need a game ticket to enter. The Family Weekend Game Day Cookout is a great way to get fueled up before the game. This popular event at Couch Baseball Park (located a stone’s throw from BB&T Field) will offer an all-you-can-eat menu in a slightly more relaxed setting. Cash bar will be available and the Deacon might even pay us a visit! 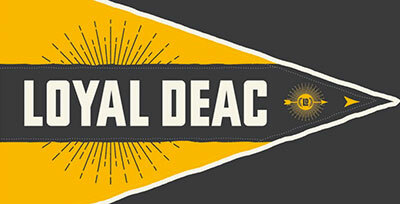 It happens that our local fairgrounds are located just across Deacon Blvd. from BB&T Field, and in fact even share some parking lots. The Dixie Classic Fair is a local tradition and draws huge crowds. 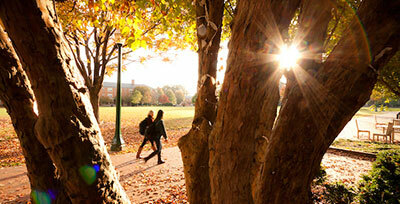 Mix the throngs of fair-goers with a WFU home game and what do you get? A major traffic snarl. We recommend taking a free shuttle to the game, rather than trying to drive and park; however, even the shuttles can be delayed sometimes. Make plans to start early, especially if you have tickets for the Cookout. Questions about the football game? Contact our office or the Athletic Ticket Office at 336-758-3322 ext. 1.